I went to the Pennsylvania National Quilt Extravaganza last week in Philadelphia . I lined up early with all the other’s that were getting off buses. (I drove, I got a whole hour in the car by myself..each way!) There is so much excitement in the wonderment of what new treasures you can create by the items on the other side of the door. It’s funny, once I got my brochure, it was like mapping out a scavenger hunt. Where are the booths I want to hit up first? Do I want to go look at the quilts on display? OR Do I want to look for some new books? OR do I want to touch all those fun fabrics that keep calling my name? OR do I want to go test drive a machine I am dying to get. Wait, back up. Where’s the booth with my test drive…it’s not here but I saw it on the promotional stuff online. BUMBER! Well that just made my visit less expensive! Say “thank you” hubby! So I started with the books and picked up two that I was dying to get. The first was Quilting Modern with quilts by Jacquie Gering and Katie Pedersen. It did not disappoint. It instantly gave me ideas with some stash I had back home. So excited to be able to put some existing fabric to work. I loved how this book took each individual shape and gave ideas on how to approach it . I cannot wait to play on my machine! She has done a great job of looking at an overwhelming canvas and breaking it down into smaller sections. After the books, I went through the quilts on display. They had a lot of traditional quilts with some interesting interpretations. They did not have a Modern Quilt section but they did have a section called, “Innovative Category”. The quilts all displayed a story about how the artist came to create their quilt. I love that about quilts. There is always a story! The last purchase I made was for some Oakshott Fabric. There seemed to be a mess of bloggers writing about the beauty of this cotton fabric…it shines! Until I saw it in person, I did not understand. Oh the possibilities! I got this from Pinwheels booth. I am thinking of using the purple as a background and doing something fun with the pink and the green. Should be a great contrast. My time is up and now I need to take all these great ideas back home and make them happen. The best part now…the drive home with my thoughts and aspirations. All big aspirations, reality…usually a bit smaller. At least with a Quilt Show it gives you a place to let your imagination fly. If I could fall from the sky, I would hope to fall in a fabric shop surrounded by colorful, cheerful materials all around me. The rows of color just make my head swim with possibilities. It’s like Pinterest, “LIVE”. I love patterned fabric and to see all the creative designs that people have come up with, but I always seem to find my way back to the solids. A fabric shop is to a quilter, as a blank canvas is to a painter. Everyone has their own quilt making process. Some show up at the shop with a pattern in hand. They buy all the required fabric amounts, sometimes even the identical fabric from the pattern. They love the feeling that, “I’m going to make THIS.” I have been that person and it is a great feeling of accomplishment, trust me! It is also wonderful feeling when you have someone in mind for a particular quilt. It makes the care you put into making the quilt even more special. I love to play a game with myself while I’m browsing the shop. I watch people and wonder, who are they making this quilt for? Do they just want the feeling of accomplishment? Do they have a plan? 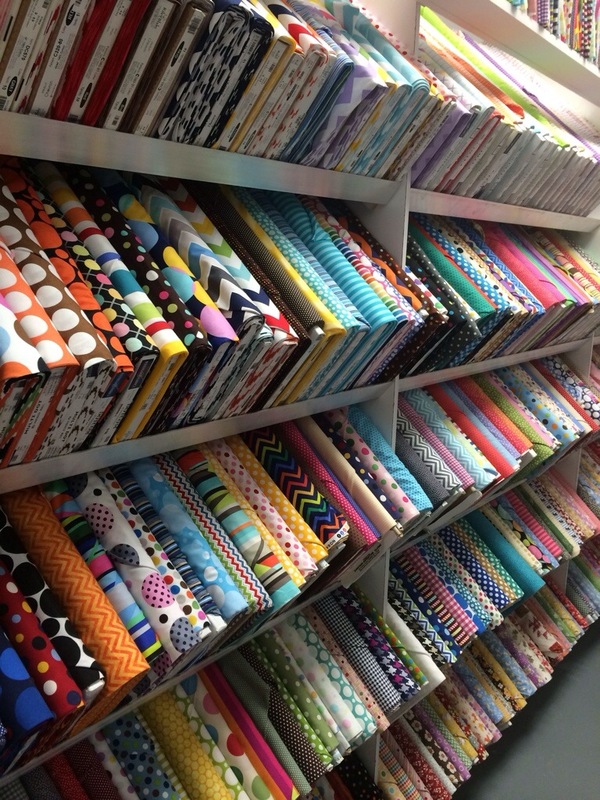 Or are they like me and just love the feeling a fabric shop gives me…the ability to imagine! For me, my life is like anyone else’s. It is full of time schedules, rules to follow, making sure others are following rules, helping others, keeping everyone in line and out the door at the appropriate time, etc. In a fabric shop, I allow myself to be the one that needs help and to ask questions and to learn from this spontaneous collection of people that know a heck of a lot more about quilting than I do. It’s also the one place I just let myself and my mind wander. I go in and browse, wander through the aisles and see what catches my eye. I touch, stare,and imagine what I could make! There is something bizarre about touching all this fabric. Something manages to just send a jolt to your brain. This is the fabric for me, this is the fabric that starts my next quilt. It is usually a print with some type of moxie of color and design that matches my personality of the day. This becomes my backing, “4 yards please.” From here I wander over to the solids (yes, the solids, me and my solids) I find the colors that strike me the most. I’m a sucker for any bright pink and Kona Snow. I picked one that was called “wasabi” once. I just had to incorporate it because of it’s name. Now the question of how much fabric? How little? I don’t know, just some? For me, I like a problem to solve. When I get home, I decide by staring. I just imagine. What will it be? Stripes? Half square triangles? A dose of a Wonky Block I want to try? I don’t know until I start to cut into it. I just trust my instincts and go!